DIE Veneris, 25 die Julii. Ordinance for a Collection for the Sufferers by Fire at Leighton Buzzard. Message from the H. C. to defer the Hearing their Impeachment against the E. of Stamford & al. Message to the H. C. about it, and with the Ordinance for Leighton Buzzard. Causeway at Parliament Stairs to be surveyed. Letter from the Committee at Cambridge, desiring Officers may be appointed to the Horse they have raised. Lords Lieutenants of Counties to grant them. Proclamation for Officers to repair to Reading. Mr. Thayne, Black Rod, to have an Order for Possession of Windsor Little Park. Message to the H. C. with the Letter from Cambridge, &c. and for Officers to repair to Reading. Message from thence, to the same Effect, and to expedire the Instructions for the Commissioners going to Scotland. Thompson and Wainwright's Petition, about a Ship of theirs stayed in the Isle of Man. Arnold, for abusing the Earl of Stamford. Ordinance to increase the Incomes of the Ministers of Derby out of Mr. Bullock's Estate, held by Lease of the Dean and Chapter of Lincoln. 2. That they agree to the Two Lords their Lordships added to the Committee for Irish Affairs; and have appointed a proportionable Number of their House. 3. They agree that the Committee for the Lord Savill's Business, and the Scotts Papers, do meet, as was desired. 4. Concerning the Petition of Roger Le Strange, and to the other of Captain Carpenter and Lieutenant Spotts, they will send an Answer by Messengers of their own. This Day an Ordinance was brought, for a Contribution and Collection for the Loss by Fire sustained by the Inhabitants of Leighton Buzzard, in the County of Bedford; and read Thrice, and approved of. To desire their Lordships would appoint another Day for hearing the Cause of the Earl of Stamford's Impeachment and others, because they cannot be ready this Day. Ordered, That this House appoints Monday next for the Earl of Stamford's Business. That this House agrees to put off the Trial of the Earl of Stamford's Business for a longer Time; and will send the Day by Messengers of their own. To let them know, that the Lords have appointed Monday next for the Hearing of the Earl of Stamford's Business and others; and, in regard it concerns his Lordship so much, their Lordships have appointed so short a Day. 2. To desire Concurrence in the Ordinance for a Collection for Layton Buzzard. Upon reading the Petition of the Watermen at the Parliament Stairs; shewing, "That the Causeway going down from the Parliament Stairs, since the Beginning of this Parliament, is much decayed and out of Repair, so that the Petitioners cannot with any Conveniency, at a Low Water, land any Fare, or perform that Service to their Lordships; therefore they humbly pray, that the Master Surveyor of His Majesty's Work may be Ordered to survey the Defects of the said Causeway, and that forthwith there may be Workmen employed in the repairing thereof, to make it serviceable to their Lordships." It is Ordered, that Enquiry be made, who formerly repaired this Causeway; and then this House will further consider of this Business. The Earl of Northumb. reported from the Committee of both Kingdoms, "That they have received a Letter from the Committee of Cambridge, wherein the Committee of both Kingdoms desire their Lordships Directions." 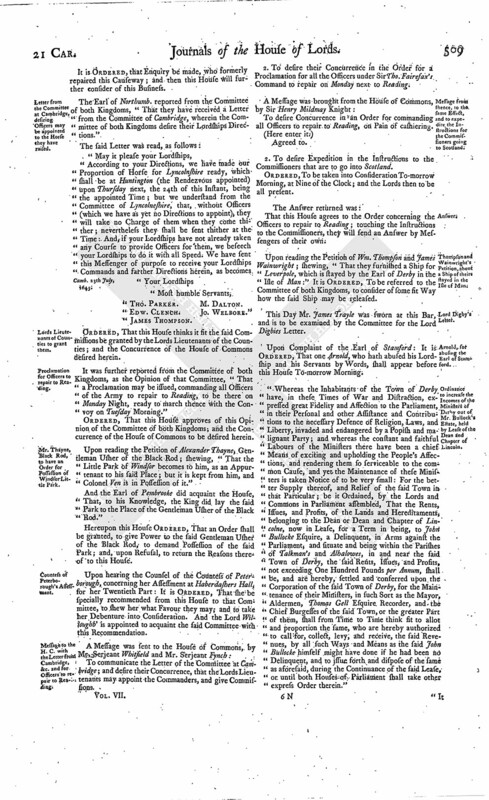 "According to your Directions, we have made our Proportion of Horse for Lyncolnshire ready, which shall be at Huntington (the Rendezvous appointed) upon Thursday next, the 24th of this Instant, being the appointed Time; but we understand from the Committee of Lyncolneshire, that, without Officers (which we have as yet no Directions to appoint), they will take no Charge of them when they come thither; nevertheless they shall be sent thither at the Time: And, if your Lordships have not already taken any Course to provide Officers for them, we beseech your Lordships to do it with all Speed. We have sent this Messenger of purpose to receive your Lordships Commands and farther Directions herein, as becomes. Ordered, That this House thinks it fit the said Commissions be granted by the Lords Lieutenants of the Counties; and the Concurrence of the House of Commons desired herein. It was further reported from the Committee of both Kingdoms, as the Opinion of that Committee, "That a Proclamation may be issued, commanding all Officers of the Army to repair to Reading, to be there on Monday Night, ready to march thence with the Convoy on Tuesday Morning." Ordered, That this House approves of this Opinion of the Committee of both Kingdoms; and the Concurrence of the House of Commons to be desired herein. Upon reading the Petition of Alexander Thayne, Gentleman Usher of the Black Rod; shewing, "That the Little Park of Windsor becomes to him, as an Appurtenant to his said Place; but it is kept from him, and Colonel Ven is in Possession of it." And the Earl of Pembrooke did acquaint the House, That, to his Knowledge, the King did lay the said Park to the Place of the Gentleman Usher of the Black Rod." Hereupon this House Ordered, That an Order shall be granted, to give Power to the said Gentleman Usher of the Black Rod, to demand Possession of the said Park; and, upon Refusal, to return the Reasons thereof to this House. Upon hearing the Counsel of the Countess of Peterborough, concerning her Assessment at Haberdashers Hall, for her Twentieth Part: It is Ordered, That she be specially recommended from this House to that Committee, to shew her what Favour they may; and to take her Debenture into Consideration. And the Lord Willoughb' is appointed to acquaint the said Committee with this Recommendation. 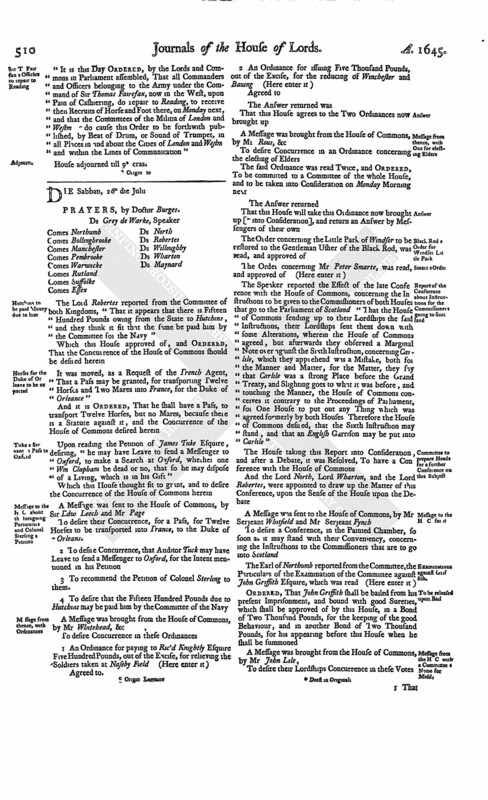 To communicate the Letter of the Committee at Cambridge; and desire their Concurrence, that the Lords Lieutenants may appoint the Commanders, and give Commissions. 2. To desire their Concurrence in the Order for a Proclamation for all the Officers under Sir Tho. Fairefax's Command to repair on Monday next to Reading. To desire Concurrence in an Order for commanding all Officers to repair to Reading, on Pain of cashiering. 2. To desire Expedition in the Instructions to the Commissioners that are to go into Scotland. Ordered, To be taken into Consideration To-morrow Morning, at Nine of the Clock; and the Lords then to be all present. That this House agrees to the Order concerning the Officers to repair to Reading; touching the Instructions to the Commissioners, they will send an Answer by Messengers of their own. Upon reading the Petition of Wm. Thompson and James Wainwright; shewing, "That they furnished a Ship for Leverpole, which is stayed by the Earl of Derby in the Isle of Man:" It is Ordered, To be referred to the Committee of both Kingdoms, to consider of some fit Way how the said Ship may be released. This Day Mr. James Trayle was sworn at this Bar, and is to be examined by the Committee for the Lord Digbies Letter. Upon Complaint of the Earl of Stamford: It is Ordered, That one Arnold, who hath abused his Lordship and his Servants by Words, shall appear before this House To-morrow Morning. 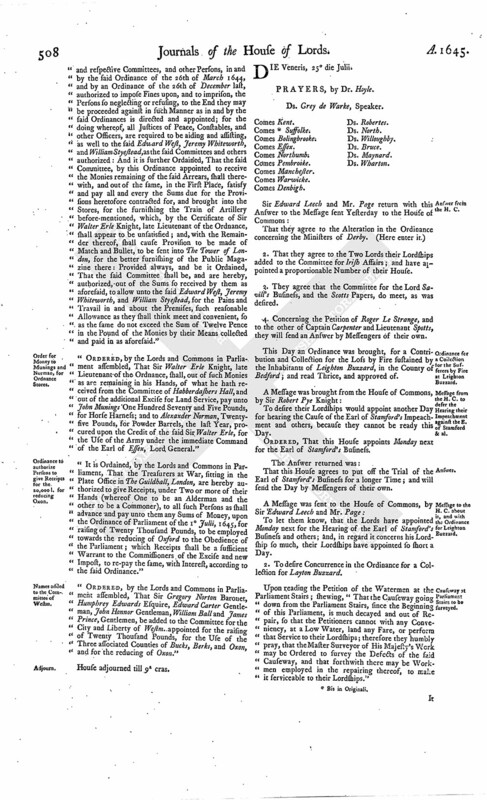 "Whereas the Inhabitants of the Town of Derby have, in these Times of War and Distraction, expressed great Fidelity and Affection to the Parliament, in their Personal and other Assistance and Contributions to the necessary Defence of Religion, Laws, and Liberty, invaded and endangered by a Popish and malignant Party; and whereas the constant and faithful Labours of the Ministers there have been a chief Means of exciting and upholding the People's Affections, and rendering them so serviceable to the common Cause, and yet the Maintenance of these Ministers is taken Notice of to be very small: For the better Supply thereof, and Relief of the said Town in that Particular; be it Ordained, by the Lords and Commons in Parliament assembled, That the Rents, Issues, and Profits, of the Lands and Hereditaments, belonging to the Dean or Dean and Chapter of Lincolne, now in Lease, for a Term in being, to John Bullocke Esquire, a Delinquent, in Arms against the Parliament, and situate and being within the Parishes of Talkman's and Alhalowes, in and near the said Town of Derby, the said Rents, Issues, and Profits, not exceeding One Hundred Pounds per Annum, shall be, and are hereby, settled and conferred upon the Corporation of the said Town of Derby, for the Maintenance of their Ministers, in such Sort as the Mayor, Aldermen, Thomas Gell Esquire Recorder, and the Chief Burgesses of the said Town, or the greater Part of them, shall from Time to Time think fit to allot and proportion the same, who are hereby authorized to call for, collect, levy, and receive, the said Revenues, by all such Ways and Means as the said John Bullocke himself might have done if he had been no Delinquent, and to issue forth and dispose of the same as aforesaid, during the Continuance of the said Lease, or until both Houses of Parliament shall take other express Order therein." "It is this Day Ordered, by the Lords and Commons in Parliament assembled, That all Commanders and Officers belonging to the Army under the Command of Sir Thomas Fairefax, now in the West, upon Pain of Cashiering, do repair to Reading, to receive then Recruits of Horse and Foot there, on Monday next, and that the Committees of the Militia of London and Westm (fn. 2) do cause this Order to be forthwith published, by Beat of Drum, or Sound of Trumpet, in all Places in and about the Cities of London and Westm and within the Lines of Communication"